Outrageous Bear’s Breeches for hot and sunny aspects. Forms large rosettes of spiked intricate leaves that almost lay flat on the ground. In summer, enormous chalice-like soft purple blooms rise to 2′ tall. Each flower opens to reveal yellow petals. A beautiful combination. Full sun and rich, well drained soil with light summer water. Give this plant room and air circulation. It does not like to be crowded. Fully cold hardy and completely winter deciduous. 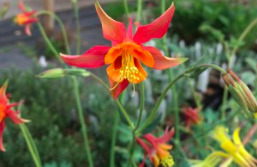 Established plants can get by on less water. Moderate deer resistance. To 2′ wide in several seasons. Spectacular cut flower. 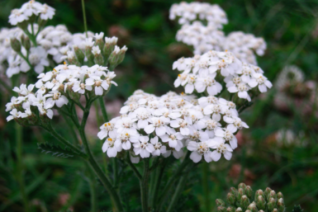 This is the locally native form of our wild yarrow. 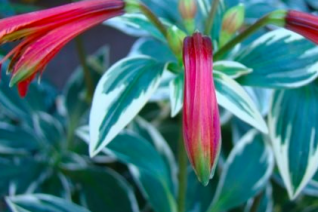 A rambunctious, easy to grow evergreen perennial for rough sites in well drained soil in full sun. Continuously from spring to autumn ‘umbels’ of pure white flowers rise 18″ above low spreading aromatic, finely divided ferny foliage. 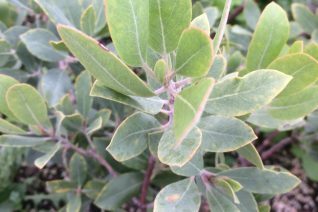 Most often it is green with variants that have gray foliage from time to time. Low water perennial that can even be used as a lawn substitute. A single plant spreads to several feet wide. Moderate deer resistance. Butterflies oh the butterflies. Oregon native plant. 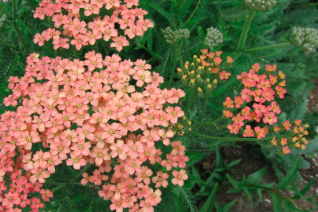 Of all the selections of our native yarrow this stands out for many reasons. The ‘umbels’ of flowers are a rich red which holds the color for an extended period. It fades only slightly to a rust red with time. Its vigorous and easy to grow. And it re-blooms reliably if spent flowers are removed. All the way until frost and sometimes longer. A very, very good long-lasting cut flower. To 18″ tall forming spreading colonies. Semi-evergreen. Low water when established in well-drained soils. Excellent to moderate deer resistance. Oregon native plant. 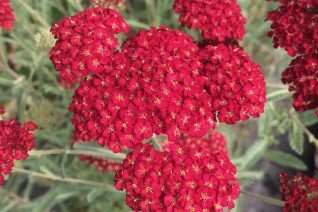 Yarrow is an unbeatable native perennial that blooms for a LONG time with a minimum amount of effort from the gardener. Foamy, ferny gray green leaves creates a low carpet of evergreen foliage. Rising up on 2′ spikes flat umbels of soft salmon flower create landing pads for pollinators. The flowers fade lightly after opening for a wonderful multicolor effect. Remove spent flowers, apply a little water and it will repeat bloom until frost. Best in lighter soils that are enriched but drain quickly. Best floral displays occur with light consistent summer water though it is very drought tolerant when established. Tolerates the toughest, hottest sites. Admirable if a little pungent cut flower. 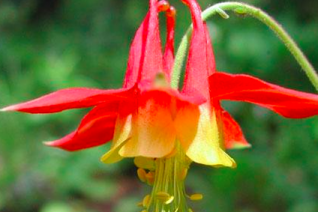 LOVED by pollinators. Creates a growing patch to several feet wide quickly. Blooms spring- autumn. Moderately deer resistant. Borders, dry borders, hell strips, etc. Oregon native plant. 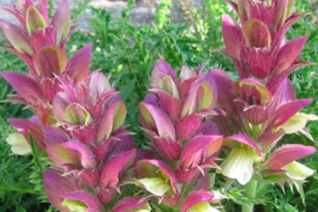 Cute little perennial Snapdragon species native to the mountains adjacent to the Mediterranean. 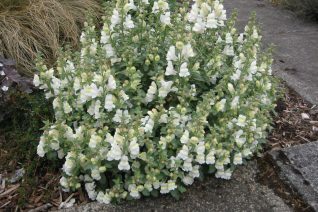 Gray-green, almost succulent foliage is lush and is great with the profuse white snapdragon flowers which appear from late spring to mid summer. Full sun and rich to average, well-drained soil. Light summer water. Gets by with none but doesn’t look as good. Dies completely to the ground in winter and quickly resprouts from the base in spring. Rock gardens, gravel gardens, borders, hellstrips. One of the most picturesque Manzanitas, this selection bears lovely gray-green leaves that are nearly circular, held perpendicular to the stems. The bark is one of the best of all species and selections, deep burgundy/purple and smooth. Vivid pink flowers that appear in late winter to spring transform into small russet red apple-shaped fruits. To 6’ tall and 4’ wide in 5 years. Requires well drained soil with little additional irrigation when established. Cold hardy. Good looking year round. 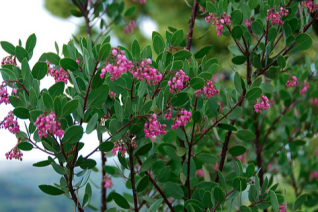 This form of our native Hairy Manzanita was found quite far east of the Cascade crest and offers greater hardiness to cold. Unfortunately, it has the same characteristics of the species- it is unpredictable. To 4′ x 7′ with sage gray leaves and white to pink-tinted flowers in spring. Very well-drained soils in an open position with NO summer water when established. Dramatic smooth mahogany bark is an outstanding feature. This is the variety that is best suited to life in the Columbia River Gorge and possibly eastern Oregon. Best with total neglect and full sun. Russet berries follow the flowers into summer and autumn- always consumed by wildlife. Very limited quantities. Oregon native plant.